GULFPORT, Louisiana, – Contrary to recent media reports of a quick recovery in the Gulf of Mexico, scientists and biologists are “deeply concerned” about impacts that will likely span “several decades”. Cake’s grim assessment stems partially from a comparison he made to the Exxon Valdez oil disaster and the second largest oil disaster in the Gulf of Mexico (BP’s being the largest), that of the Ixtoc-1 blowout well in the Bay of Campeche in 1979. He is also concerned about deepwater habitats. Given that BP has used at least 1.9 million gallons of chemically toxic dispersants, the vast majority of the oil has remained beneath the surface, and much of that has sunk to the sea floor. As an example, he cited “a new coral colony ecosystem” within 10 miles of BP’s blowout Macondo Well, which was found by a pipeline company whilst it was producing an environmental impact assessment statement of the route of the pipeline. Dr. Stephen Cofer-Shabica, an oceanographer in South Carolina, focuses on the biology of barrier islands. He monitored the affects of the Ixtoc-1 oil disaster on Padre Island National Seashore in south Texas. “You can go back now, 31 years later, and there’s still oil in the sand there [Padre Island],” he told IPS. But his main concern is now about what the state of Louisiana is doing in response to BP’s oil disaster. Louisiana’s Governor Bobby Jindal has authorised the dredging and building of sand berms near Louisiana’s barrier islands in an effort to keep oil away from the shore. One area where the dredging project is still underway is the Chandeleur Islands. BP and the Coast Guard are currently under scrutiny for having used so much oil dispersant, an industrial solvent that breaks up the oil so that it will sink below the surface. 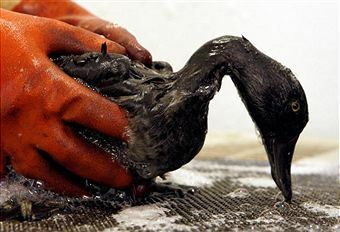 For example, a 1979 report, “Effects of Corexit 9527 on the Hatchability of Mallard Eggs” in the Bulletin of Environmental Contamination and Toxicology, showed that even though dispersants are applied to minimise oil impacts to visible and charismatic species, Corexit actually enhances the lethal effects of crude oil on birds that are exposed. Corexit 9527 penetrates eggshells and shell membranes as readily as crude oil. When applied to an eggshell near the embryo, the embryo would fuse to the shell membrane and die within 24 hours. According to Dr. Cake, his study teams have people watching and monitoring affected areas. Chasidy Hobbs with Emerald Coastkeeper in Pensacola, Florida, is on the City of Pensacola Environmental Advisory Board and Escambia County Citizens Environmental Committee. Hobbs also directs the environmental litigation research firm, Geography and Environment. Dr. Cake is among a large and growing group of scientists who are discussing a grim future for much of the Gulf of Mexico as a result of BP’s disaster.